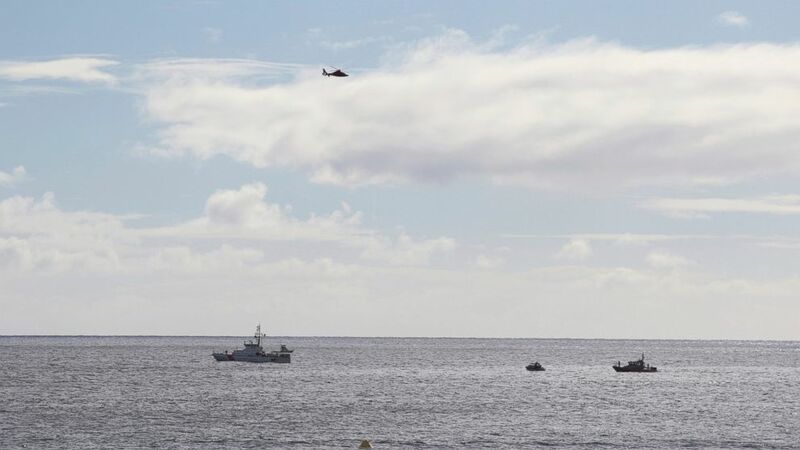 A pilot flying a 1950s-era fighter jet as part of a military exercise has been rescued in the waters off of Honolulu after his aircraft crashed into the ocean. The airplane's crash and the pilot's rescue were captured on photos and videos posted on social media. "Joint Base Pearl Harbor-Hickam is confirming a Hawker-Hunter aircraft operated by a civilian contractor has crashed into the ocean five miles south of Sand Island at approximately 2:28 p.m., today," said a statement from the military base located in Honolulu, Hawaii. "The contractor ejected safely, and was initially rescued by a private sailboat then transferred to a U.S. Coast Guard vessel" said the statement. "Federal Fire responded and City and County EMS was dispatched to Sand Island to treat and transport the patient to a hospital," it continued. "Joint Base Pearl Harbor-Hickam does not have further details of the pilot's condition at this time." Sand Island is located east of the Honolulu airport and west of downtown Honolulu. The pilot was flying the 1950s-era British-made fighter jet as part of the Sentry Aloha exercises being hosted by the Hawaii Air National Guard at the base. That exercise has been temporarily suspended in the wake of the accident. Images posted on social media show the pilot parachuting from the aircraft at a low altitude before it crashed into the water. The Hawker Hunter aircraft was likely participating in the exercise as an enemy aircraft in simulated fighter exercises. That role used to be handled by military pilots, but increasingly the U.S. military is contracting out that role to private companies that operate dated military aircraft.